Import existing Articulate Quizmaker quizzes into Articulate Storyline to take advantage of existing question lists. Tip: Quizmaker doesn't need to be installed to import quizzes. Click Import on the Storyline launch screen and select Import Quizmaker. Go to the File tab on the Storyline ribbon, scroll to Import, and click Quizmaker. Go to the Home tab on the ribbon, click New Slide, select Import on the left, and choose Quizmaker. 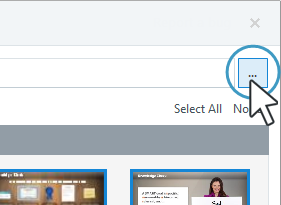 Go to the Insert tab on the ribbon, click New Slide, select Import on the left, and choose Quizmaker. Browse to the Quizmaker quiz you want to import and click Open. If you opened the wrong quiz or want to select a different one, click the ellipsis button (...) in the upper right corner to browse for another file. 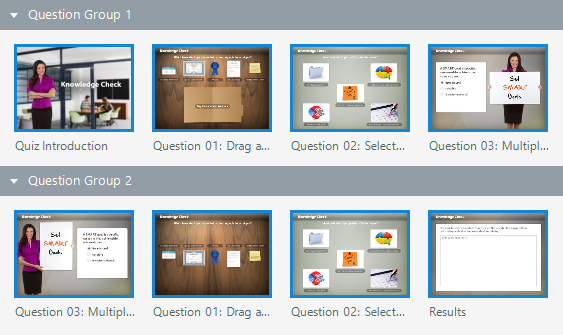 Storyline will display thumbnail images for all the slides in the quiz, divided into question groups based on the original quiz file. Select the slides you want to import. By default, all slides will be imported unless you specify otherwise. 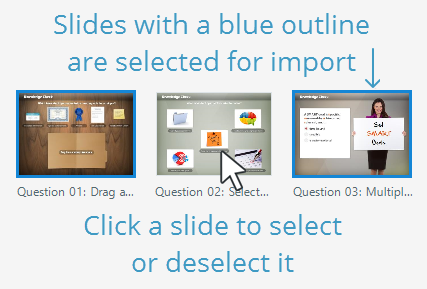 You can tell which slides are selected by their blue outline. You can also use the Select All and None hyperlinks in the upper right corner to quickly select or deselect all the slides at once. To select or deselect an entire question group and all the slides it contains, click the question group name. Use the Insert into scene drop-down at the bottom of the window to choose where the quiz slides should appear in your course. You can insert them into a new scene, which is the default option, or you can choose an existing scene. If you choose a new scene, use the Scene field to give it a name. Tip: Question groups that are set to randomize in Quizmaker will be imported into Storyline as question banks. Question groups that aren't set to randomize in Quizmaker will be imported into Storyline as normal slides in the selected scene. 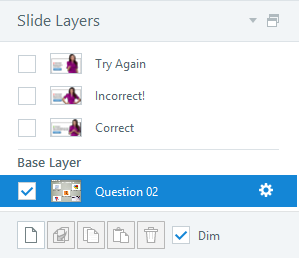 After importing a quiz into Storyline, you can edit questions like any other slide. You can also use the Form View and Slide View buttons in the Question panel on the right side of the screen to toggle between both editing workspaces. To learn more about the question editor, including scoring, number of attempts, feedback, and branching, see this tutorial. Storyline uses feedback layers to display feedback for each question. There are various types of feedback you can give learners, including Correct, Incorrect, Try Again, Review, and Thank You. Storyline will automatically generate some feedback layers for you, but you can add more. To add, edit, or delete feedback layers, go to the question slide you want to modify, then use the Slide Layers panel in the lower right corner of the screen. 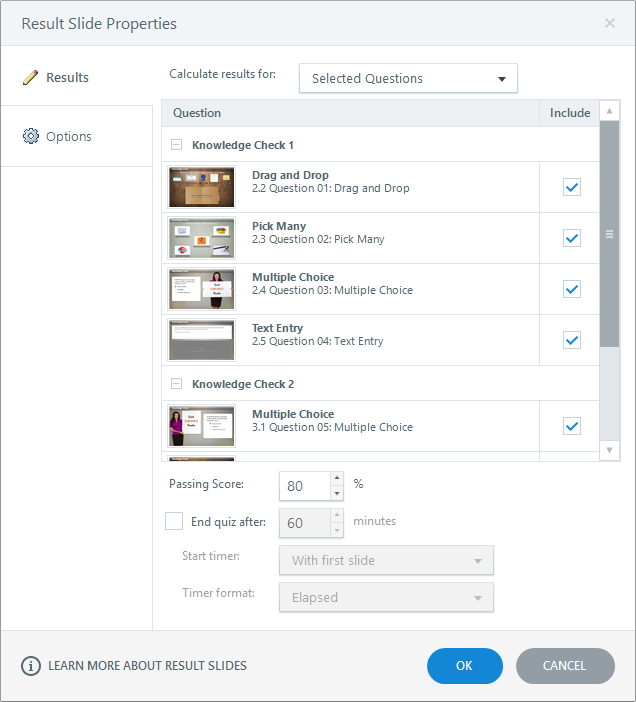 When you import a quiz into Storyline, the result slide from the quiz will automatically be imported as well, and the imported questions will be associated with that result slide by default. However, Storyline supports multiple result slides in the same project, so you can change the result slide that tracks each question. Learn more about result slides here.